After the Hitler’s troops captured Smolensk in 1941, a severe occupation regime was immediately established in the city. Any person could get under the repression by the any provocation: because of the curfew violation, an unreturned bicycle, a radio or a camera, a late visiting of the labor exchange … At the best the violators got in the concentration camp, but as usual they were shot. On the edge of Smolensk, in the ravines of the Readovka park, during the occupation, the Germans carried out mass executions — primarily the civilians. But among people, who were shot, there still were those who fought against the Nazis regime even in the occupation conditions, — they were Smolensk members of the clandestine. Only in May of 1942, after long tortures here were executed by 150 members of the city clandestine. There is known an episode, relating to the August 15, 1942. Here, to Readovka, for being shot were taken about 60 Smolensk members of the clandestine. They did not want to go to the place of execution, like a cattle to the slaughter-house, and they began to fight back. They killed several German guards, seized personal weapons, but one of the Nazis survivors raised the alarm, and the patriots died in an unequal battle. The only one, who managed to escape, was Alexander Stepanov, who told about the incident. Now at the place of those mass executions, not far from the Barrow of Immortality, there is a memorable memorial «Grieving Mother». It was opened in 1970, the authors are architects A. Stemparzhitsky and G. Soosar, sculptor A. Sergeev, artist C. Novikov. Next there is a concrete wall with a mosaic picture of the rebellious Soviet patriots execution. Next to the wall – there is a Sorrowful Mother sculpture, a woman, frozen in a silent despair. Her head, with a kerchief round, is bowing low, her palms of the drooped hands are clenched. The Mother can only grieve, and we can not forget the feat of her sons. 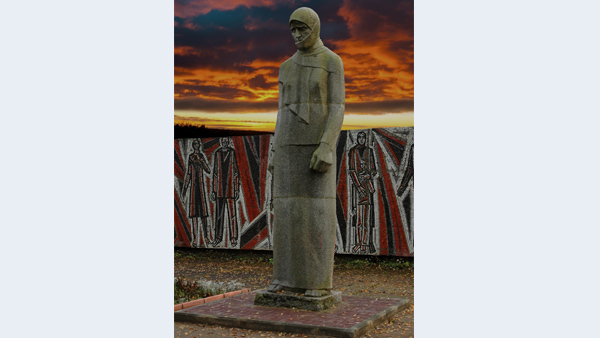 Memorable Memorial, located on the Chernyakhovsky street, in Readovka, placed under state protection as an object of cultural heritage (the monument of history and culture) of regional importance «Monument to the Nazy Victims — «Grieving Mother».